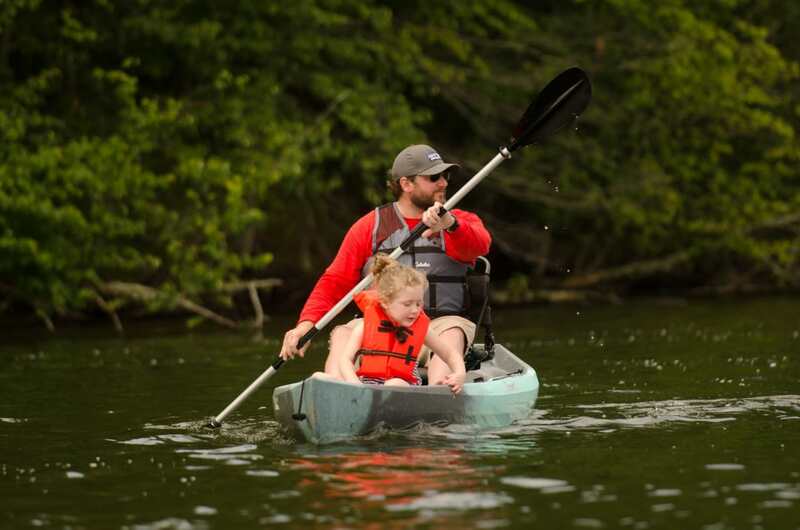 Within Alabama, there are also a number of canoe and kayak "trails," where local boaters, organizations and state officials have identified specific routes as well as campsites and amenities available along the way. Whether you’re interested in day trips or longer paddling journeys, this quick and dirty guide will point you in the right direction with highlights of several prominent water trails in the state. According to the National Park Service, the 631-mile Alabama Scenic River Trail, or ASRT, is the longest river trail in a single state. Paddling the entire main "core" route of the trail from Cedar Bluff, Alabama, near the Georgia state line to the Gulf of Mexico at Fort Morgan is a true adventure that will test your skills and stamina. As you wind through the heart of Alabama on the Coosa River, you’ll encounter some fun shoals and at Moccasin Gap negotiate a boulder-strewn corridor with Class II/III rapids. You can relax as you paddle lazily along the banks of scenic Lake Martin with its rocky hillsides and lush, green forests, experience true Southern bayous in the Mobile-Tensaw Delta, and then find yourself in the crashing surf of the Gulf of Mexico. If you don’t want to paddle the entire ASRT at once, it’s possible to "section paddle" the entire length. A true wilderness adventure paddle awaits you only miles from Mobile in "America’s Amazon," the Mobile-Tensaw Delta. Covering a whopping 250,000 acres, the Mobile-Tensaw Delta includes 100,000 acres that are owned and managed by the state and open to the public. Paddlers can explore this massive wilderness by following the 200-mile Bartram Canoe Trail, which is comprised of six day-use trails and six overnight trails, giving paddlers several options for trips of varying lengths. Living in this intricate web of bayous, sloughs, and lakes are 50 rare and endangered species of plants and animals. The ecosystem includes bottomland hardwood forests, breathtaking but moody cypress-tupelo swamps, an historic Indian mound in the absolute middle of nowhere, and estuarine marshlands teeming with wildlife. As you paddle along, you’ll be under the "watchful" eyes of hundreds of American alligators. Adding to the sense of adventure, you can even sleep under the stars on floating campsites. Just a little northeast of the town of Rockford flows Hatchet Creek, a beautiful river with some fast shoals that feeds the Coosa River and Mitchell Lake. The Hatchet Creek Canoe Trail gives you easy access to this fun trip with six landings to launch and take-out, starting in the town of Goodwater and ending just north of Rockford on County Road 18. Locals will tell you that the best time to paddle the river is in the spring when the mountain laurel is in full bloom brightening the banks and in late May when the rare Cahaba Lily appears with its snowy white pedals. That’s also a good time to try your hand at a couple of nice drops and a Class II rapid that courses over a rocky bottom after spring rains fill the creek. Along the trail you’ll pass several historic sites, including the towering steel Goodwater Train Trestle and the Old Grist Mill. A true Southern blackwater river float trip, the Perdido River Trail is the latest addition to the state’s canoe trail lineup. On this 19-mile segment of the Pedido River, you’ll float serenely through forest of longleaf pine, Atlantic white cedar, and hardwood trees draped in Spanish moss, as bald eagles and red tail hawks soar high above you in the crystal blue sky. Stop for lunch at one of the many white sandbars that line the winding river as it flows to the Gulf, or maybe take a swim in the cool water. The trail can be paddled in its entirety by spending your nights in one of the four trail shelters that dot the route (make reservations online), or by camping on the sandbars in front of the shelters. Two landings split the trail in half, so you can make each day a nice, leisurely paddle. On the Alabama Gulf Coast, the Orange Beach Canoe Trail gives you the opportunity to try some saltwater kayaking. Glistening turquoise waters and sugary white beaches highlight this shoreline route that loops several islands where the sunsets are dazzling and the dolphins are playful. The loop is 15 miles long, but there are 10 launch sites, so you can pick your own length and tailor your adventure. Plus, you’ll be close to plenty of restaurants, hotels, and entertainment, so it’s a perfect place for a weekend paddle trip. There’s a little-known canoe trail in south Alabama that’s quickly gaining recognition. The 42-mile Sepulga River Canoe Trail winds its way from the town of Travis Bridge to Brooklyn and holds a few surprises. There are plenty of places for you to stop, have lunch, and take a swim. As you paddle the river you’ll pass limestone shelves and small caves, so factor in some time to stop and take a look around. There’s a good chance you’ll find fossils from the ancient ocean that once covered the area. Plus, you’ll pass under a relic from the not too distant past—the old iron Bull Slough railroad bridge. But the real surprise is that several small waterfalls cascade down the river’s rocky banks, and there’s even a Class I rapid, unheard of in the relatively flat south part of the state. Along the route there are five separate launches, so you can make the trip as long or as short as you like. As the Elk River makes its way from the northern reaches of Alabama to the Tennessee River, it flows through the town of Elkmont, where it has been made into the Limestone County Canoe & Kayak Trail. 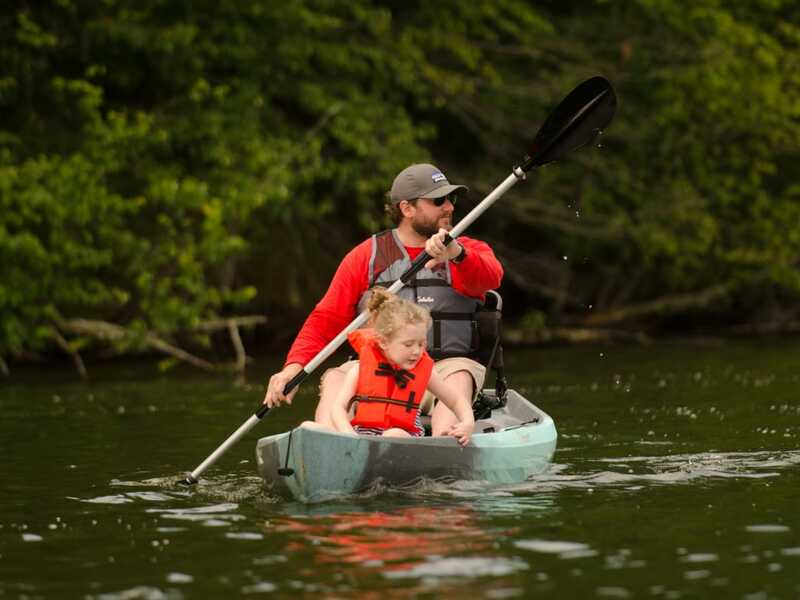 You’ll have up to 21 miles of fun as you paddle through beautiful hardwood forests, where the dogwoods bloom white and pink in summer, and the hardwoods blaze fiery colors in the fall. As you cruise down the river you’ll see rolling farmland and meadows huggin the banks. Along the trail there are five launches, so you can pick and choose how far you want to paddle. Best of all, it’s a reliable river. Because the a TVA dam controls the water levels, you can enjoy a high-quality paddling adventure even in the heat of summer.